Susan woke me at 4am saying "we have a problem." "What is it," I asked. "The Genoa came down," says she. I looked out the pilot house, saw no sail up and then gazed into the sea on the port side. There she was. We turned on the deck lights, put on our life jackets and went out into the 20 knot wind. The halyard had parted about 50 cm from the head of the sail. We pulled it slowly out of the water and onto the deck. The biggest problem was to keep it from blowing back in while we tied it down. 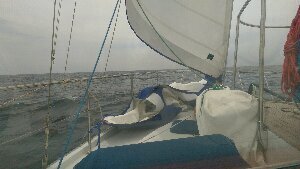 No small feat with a rolling deck, wet sail and strong wind. Of course it got done as you can see from the photo where our trusty jib has already been hoisted in place of the genoa. After a shower to wash off the salt water we reflected on the joys of sailing, then carried on. This e-mail was delivered via satellite phone using Iridium Mail & Web software.